Will Ivan Perisic move to Arsenal? With Deadline Day getting closer, we look at 10 players who could be on the move before the end of the January transfer window. Sky Sports News understands West Ham are prepared to meet the player's £43.2m release clause despite Marko Arnautovic ruling out a move away from the club. Gomez has scored nine goals in 19 La Liga appearances this season for a Celta Vigo side who are sitting 17th in the La Liga standings. Their precarious position in the league table means a deal for the 22-year-old could see him return to Celta on loan until the end of the season to help them secure survival. 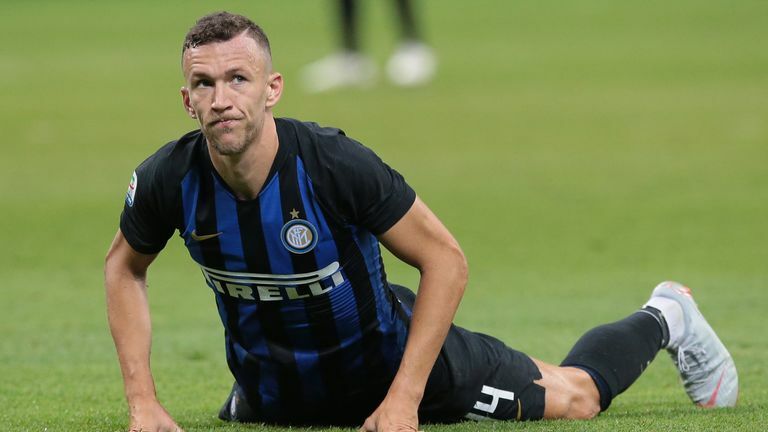 Sky in Italy are reporting that Arsenal proposed an initial loan for Perisic with an option to buy for £34.5m, but Inter appear to prefer a permanent move for the player who turns 30 on February 2. The Croatia international has struggled for form in Serie A this season, scoring three goals and registering five assists in 25 appearances in all competitions. He was not included on the bench in Inter's 1-0 loss to Torino on Sunday. 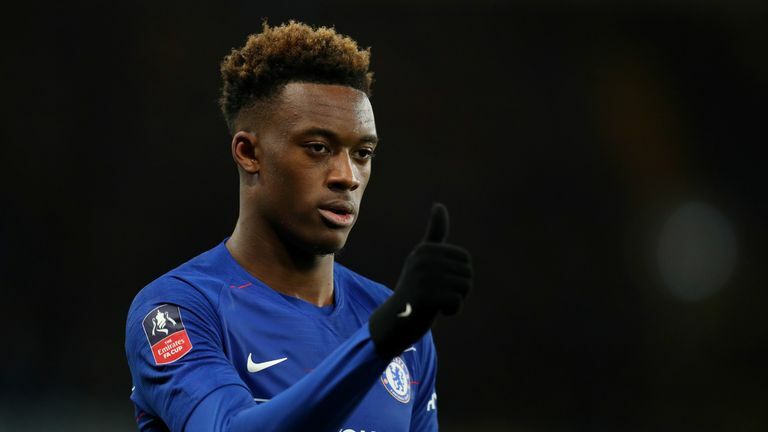 Callum Hudson-Odoi handed in a transfer request at Chelsea earlier this month following a £35m bid from Bayern Munich. However, that request has been rejected by Chelsea, who have maintained throughout the window they wanted to keep him. He admitted after Chelsea's 3-0 win over Sheffield Wednesday in the FA Cup on Sunday he did not know if he will play for the club again. The 18-year-old did not confirm whether he is in talks with Bayern, but the Bundesliga club have already made three offers for the winger who has made 11 appearances in all competitions for Chelsea this season. Hudson-Odoi has scored two goals in all competitions this season. Leicester are in talks with Monaco over a £20m deal for midfielder Youri Tielemans, Sky Sports News understands. The Foxes are believed to have been monitoring the Belgium international for some time, and he is understood to be open to a move to the Premier League. Leicester are believed to want to strengthen their central midfield area by signing the 21-year-old who has made 65 appearances for Monaco since his move in the summer last year. 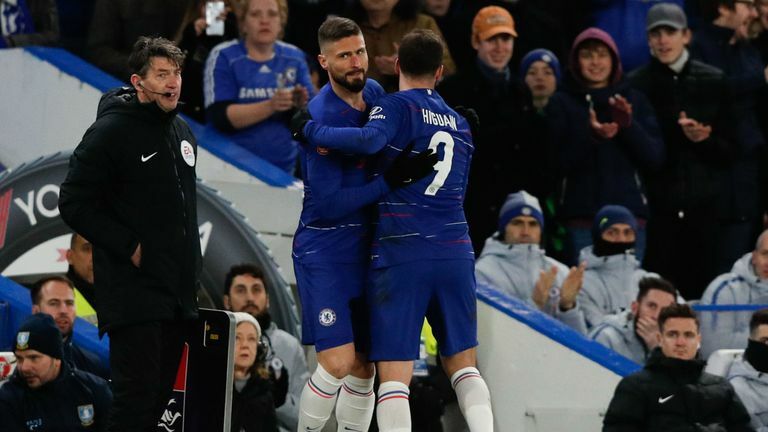 Olivier Giroud is confident Gonzalo Higuain will score goals for Chelsea, but warned he may need time to adjust to the Premier League. Olivier Giroud admits he is considering his future at Chelsea following the arrival of Gonzalo Higuain. Giroud's contract is up in the summer and says he is thinking about a move back to France. Giroud has scored once in 18 Premier League appearances this season. "If the club decides to get another striker, like Higuain, it will certainly darken my future at Chelsea," he told Canal in an interview released on Sunday. "I have never said no to a return to France. Lyon and Marseille are two great clubs. My priority is to stay in the Premier League though." Denis Suarez was left out of Barcelona's squad for Wednesday's Copa Del Rey clash against Sevilla and was an unused substitute against Girona on Sunday as he continues to be linked to a move to Arsenal. Suarez, who has made just eight appearances for Barcelona this season, was believed to be close to signing a deal with Arsenal at the start of the month. It is understood Unai Emery is keen to work with Suarez once more and the player would be happy to reunite with his former coach. The 25-year-old played under Emery on loan at Sevilla before signing for Villarreal in August 2015. The 29-year-old has asked to leave, begging Everton not to end his dream of joining PSG. Gueye, who Everton signed from Aston Villa for £7.6m two-and-a-half years ago, has made 22 appearances for the Merseyside club this season. Valencia are believed to want the striker as Michy Batshuayi is likely to leave the club this month, according to Sky sources. Austin has not played for Southampton since their 2-2 FA Cup third-round tie against Derby on January 5 which they lost on penalties. The 29-year-old's current contract expires in the summer next year. Steven Gerrard is confident Rangers can see out January without having to fend off offers for Alfredo Morelos who has been attracting interest from Ligue 1 side Nice. The 22-year-old, who has scored 21 goals for Rangers already this season, is not set to move away from the club according to Gerrard. The Rangers boss insists nobody has come up with a sufficient bid to persuade the club to sell their striker. He said: "I think there will be talk of Tav [James Tavernier] and talk of Alfredo but the reality is there hasn't been a solid bid for any of our players so far.